That’s right ONLINE, just scroll down to choose your choice of boat. Your destination of backwater, nearshore, offshore or Gulf Stream. Than add it to your shopping cart and checkout. It is that simple. Thank you for choosing Rigged & Ready Fishing Charters…. Welcome aboard our 34′ Venture! Fully equipped with bathroom! Capt. Kevin Sneed and wife Kimber absolutely feel these are some of the best boats for your day on the water. 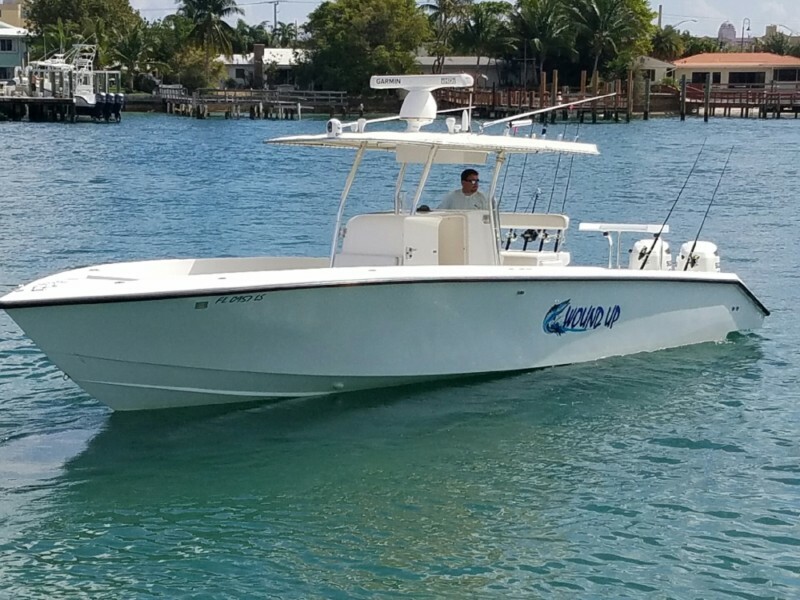 Both boats includes comfortable seating, over-sized t top with lots of shade and tons of room for fishing (360° of fishability), both boats have a bathroom and the 34 Venture offers a shower downstairs. Our Rigged & Ready Boats also have state of the art electronics by Garmin. Included in the electronics package is a 95 mile radar, thermal imaging radar by FLIR, Stereo sound system, 2 vhf radios, and underwater cameras and lighting. This 34′ Venture & 31′ Competition are powered by 600hp. Twin 300hp Yamaha’s can get you to the fishing spot fast and comfortable. Our goal is put you on top of the fish and not spend all day riding around. 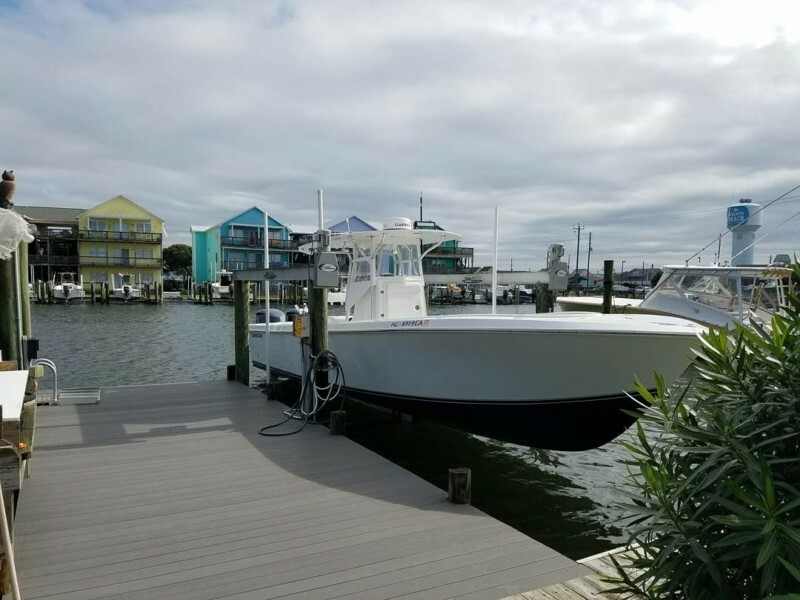 Your time is valuable and you deserve the best charter boat in Holden Beach, NC. Reservations recommended and taken with Visa/Mastercard deposit. Payment in full is taken at conclusion of trip ***CASH or Credit Cards ONLY! Rates include all bait and tackle. Tips are appreciated for good service – 15%-20% is the market standard. NOTICE: 15% Tip is the standard for the captain. The 1/2 day trips are our most popular. Depending on the time of year will depend on what fish we target. Typically we go for what’s biting best to give you the best possible experience. Examples: King Mackerel, Cobia, Sharks, Spanish Mackerel, Bluefish, Monster Bull Drum, Black Sea Bass, and Flounder. Examples: King Mackerel, Cobia, Sharks, Spanish Mackerel, Bluefish, Monster Bull Drum, Black Sea Bass, and Flounder. Snapper, Amberjacks, Cobia, Mahi Mahi, King Mackerel, Sailfish, are just a few of the different species we target offshore. This trip is for the more advanced. Call for details. Not recommended for the beginner.